Instant, hard rain, flash floods in the offing, a leaky top, flood roads and an intense, amazing drive in the night in the middle of Rajasthan during a college trip ages ago is my most visceral memory of a jeep ride. It's unfortunate that I haven't lived with one for any significant time, but I've spent my hours at the Mayapuri jeep market in Delhi looking at these all-masculine mode of transport while mentally calculating if I could afford it or not. So when I first cast eyes on the Thar, I could almost feel the plastic of my bank cards beginning to melt in anticipation. And at ` 6 lakh ex-showroom, it didn't see unreasonably priced as well. Add a wife who's always had a fascination for jeeps in general and Gypsys in particular and I could have been looking at a new member of the household. Should the Thar get pride of place in my - and by extension your - garage? Let's find out. Can't touch this, sang MC Hammer in baggy pants and he could almost be singing about the MM540's styling. It's brutal, casually disregards metrosexual fluff like aerodynamics and in proportions is a visual treat. That the Thar looks great is natural - Mahindra chose to keep the MM540's design in tact, good move. Besides glossier paint and oversize Thar logos, the jeep looks just like you think it should - chunky, substantial, hairy-chested and I-can-handle-it. However, on closer inspection, the Thar's appeal to the heart is tempered by cold details that disappoint. Panel fit is just about okay, the beadings are far from perfect, plastic quality is shudder-inducing in places and Mahindra's attempt to give the Thar a modern dashboard is rife with ergonomics issues - some of which are potentially safety issues as well. For instance, you could trap your finger between the wiper stalk and dashboard, or if you're a big guy like Martin, between the top of the steering and the lip of the instrument binnacle. The steering wheel is offset to the left noticeably and the brace for the chrome bar on top has a sharp edge that a standing passenger could easily draw blood on. All this would have passed muster without murmur a decade or two ago. But today, our constant exposure to inexpensive vehicles that sport vastly greater attention to detail and cabin quality mars the song in your heart that begins literally every time you look at the Thar. People around you, it must be said, don't notice the detail issues. All of them - man, woman and child - look gobsmacked, want to talk to you, recount jeep stories and then wistfully ask for the price. If this were Whose Line Is It Anyway, I'd give Mahindra three million points for design and appeal and take two million back for the finish issues and plastics. Bert - who has driven the Classic - would take another half million back because Mahindra itself have shown it can do better with that jeep - and I certainly believe that the Xylo - another Mahindra favourite for me - shows Mahindra can pull off tremendously functional interiors of eminently acceptable quality. Why the Thar didn't receive that care mystifies me. I mostly don't sing in road tests but the Thar makes me want to. The 105PS (at 3800rpm), 247Nm (at 1800-2000rpm) 2.5-litre CRDe engine derived from the Bolero gives the Mahindra thrilling performance. Top speed is 124kmph, 110kmph cruising when required is unruffled and smooth, the gearbox is easy to work despite long throws and slightly notchy shifts and the 4x4 selector on the floor is nice to work as well. Powertrain refinement overall is surprisingly good and bolsters my impression that this frugal (highway 16.8kmpl and city 12.92kmpl; 13.9kmpl overall) and quick - the Thar literally pushes through to air to hit 100kmph in a perfectly credible 18.93 seconds - Mahindra is a juicy car to drive. And in all this refinement is excellent. You do hear it, but you have to remember you're driving an open-top which naturally has less noise isolation. That Mahindra has gotten the vehicle this quiet, this vibe-free and this close to passenger car refinement is exceptional. Shift the stubby selector for the Borg-Warner transfer case into low and the Thar changes from loping leopard to boisterous bear. We did grind the exhaust a couple of times but that's only because the Thar is so confident, so indefatigable clambering over rocks, dancing through ruts, grinding through sand that you keep trying harder and harder. Great approach and departure angles, ample ground clearance, surprising traction even on the road-biased tyres make it easily the most capable 4x4 in the country this side of the Gypsy. Driving fully open, clipping along on dirt tracks is just plain awesome, but will also cover you in fine orange mist as the dust settles. Upshot? You'll love driving it. One of the things that the Thar gets absolutely right is the feel. It drives like you think it should and that's a huge, huge asset to its appeal. To be honest, I wasn't expecting much on these fronts. A tall, short length platform by its very nature is not suited to exceptional dynamic ability. But the Thar surprised me. Ride quality, for instance, may not be plush but also isn't choppy like the Gypsy, which means living with the Thar is going to be easy. Potholes are absorbed without fuss though the short wheelbase and soft suspension causes some pitching. If I had to drive the Thar year round, the ride quality would be eminently acceptable. Then again, it does use a Bolero-Scorpio hybrid ladderframe, with independent front suspension and semi elliptical leaf springs at the rear. The handling is a surprise as well. Height and short wheelbase usually hang out with understeer and on-road the Thar shows this. But once more, the steering wheel is rather well-servoed though not as direct as I'd hoped. The Thar's lasting impression is of a nimble, agile car that does handle nicely enough - and thank the 4x4, it curbs understeer as well. On the highway it feels nervous only if you're pushing it; 100kmph is stable and composed. Which again brings me to how close the Thar comes to being a vehicle you could easily live with as your primary vehicle. In every aspect of its behaviour lies a direct appeal to your heart. Mahindra has said from the word go that the Thar is a lifestyle vehicle that does not presume to supplant your primary transportation. That stance mitigates a lot of the issues we have with the Thar. For instance, the glove compartment isn't lockable though under the passenger seat is a lockable cubbyhole. Similarly, the six-seater(!) benches at the rear is not a space I'd offer to a friend. It's well known for being uncomfortable, especially when you are off-road. I do wish Mahindra had opted for Classic style front-facing bucket seats as standard instead. I'm guessing the benches get the Thar the 7-seater classification it needs for taxation purposes. Similarly, the lack of comforts - despite its lifestyle off-roader status - is hard to live with. Where do I put the coffee I picked up on the way to the mudpatch? Where do I stash the maps? Why is the top of the dash for an off-roader so incapable of keeping anything at all secure? Why could the front seats not be more supportive? As amazing as the Thar is as a driving experience, there's a lot of things that need to be added before it becomes practical as well. I'm going on and on about this because while the Thar's emotional appeal makes it easy to look past these niggles, taking care of them would bring the Thar closer still to both heart and brain. Mahindra is, somehow, forcing me to choose between a vehicle that is immensely fun and capable and one that is practical. What I can't understand is why, because I think the Thar could very easily be both. I desperately like the Thar. The nature of its no-frills, old-school, no-electronics performance is extremely likeable. It's capable off-road, surprisingly happy on tarmac, looks exactly right and is affordable as well. However, it does have some significant issues (as well). Plastic quality and finish levels are visibly below what we've gotten used to and the front seats are almost the sole concession to passenger comfort in the whole package. Which is disappointing. 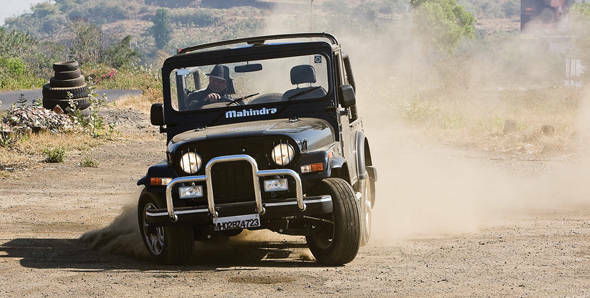 Mahindra intends for the Thar to be your leisure-oriented second-third vehicle. But I want it to be the only vehicle I need! For which I need a few more amenities. Amenities in a jeep? Call me soft, but I'd like an aircon, some cupholders, more space for my things, a music system and forward facing rear seats and some really basic safety related updates as well. These aren't big additions, but will make the Thar that much easier to convince the spouse into allowing you to buy one. That said, the Thar is such a tremendous driving experience that most of us, me included, will probabily look past these issues. Nice job, Mahindra!